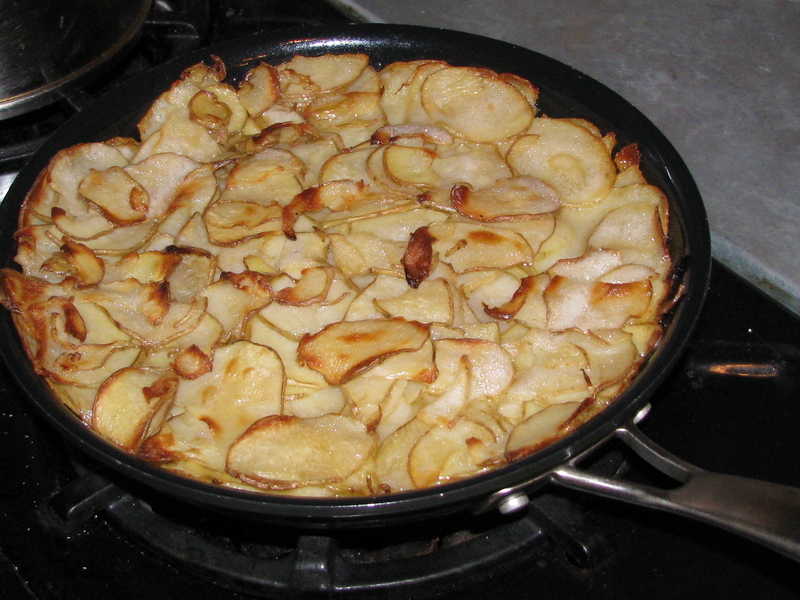 Earlier in our tour of French classics, we did a famous potato dish called Gratin Dauphinois. This famous dish is made with potatoes, cheese and, of course, butter. Possibly an even more famous French potato dish is Pommes Anna, which is even simpler – potatoes, butter, salt and pepper. This has been a favorite for over 150 years since the time of Napoleon III. The key to this dish is very thinly sliced potatoes that have been dried on paper towels. 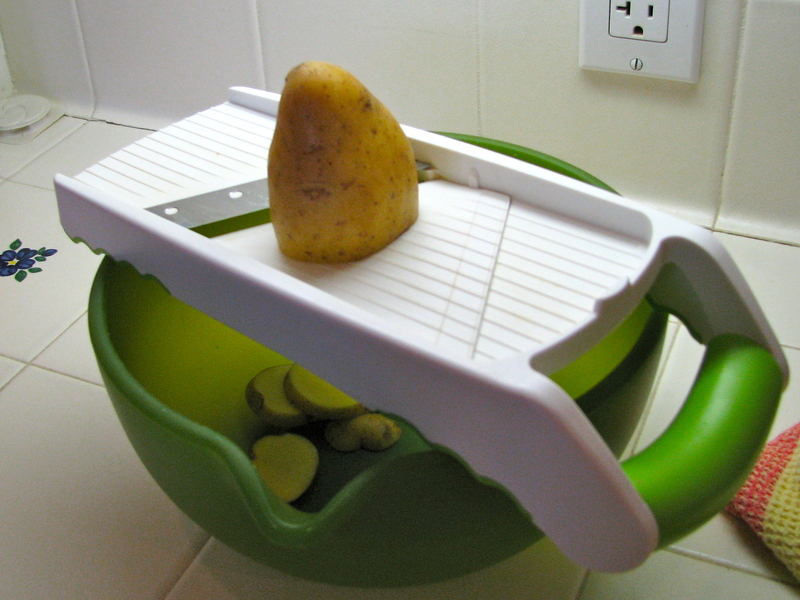 This is a great opportunity to use that mandolin (that you should have bought by now) to slice the potatoes. The dish is started on the stovetop, which helps create a crispy crust and then baked in the oven. 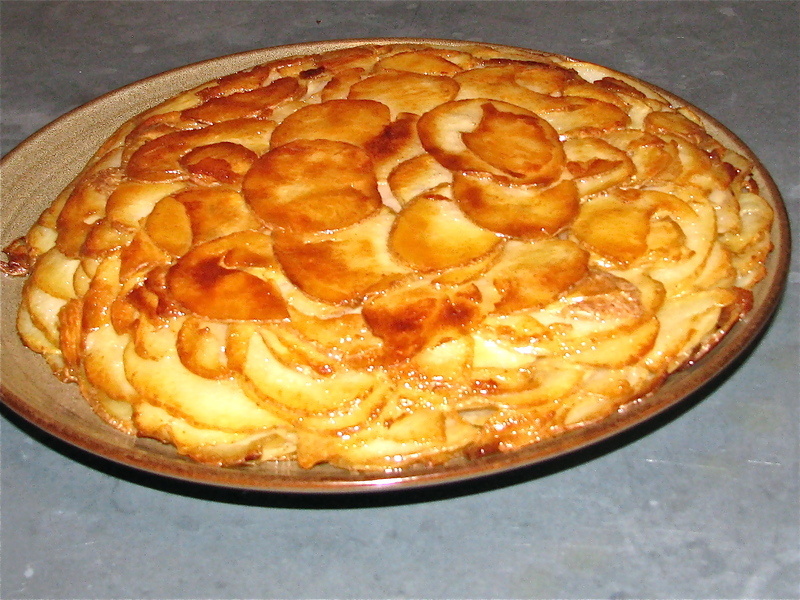 Before serving, the dish is “flipped” onto the serving dish, much like we did with the Tarte Tatin. Some of my fellow Bravado chefs have difficulty with the flipping – they tend to freeze. In their honor, we have developed the “Come to mama!” technique, guaranteed to help you get over the “yips”. Here’s what you do: (1) get the serving plate ready and put on the oven mitts, (2) take the baking dish out of the oven, (3) turn the serving dish upside down on top of the baking dish like a cover, (4) grab both sides squeezing the baking dish and the serving dish together. Now, lift and rotate the whole assembly towards you 180 degrees, saying “Come to mama!” and set it down gently. 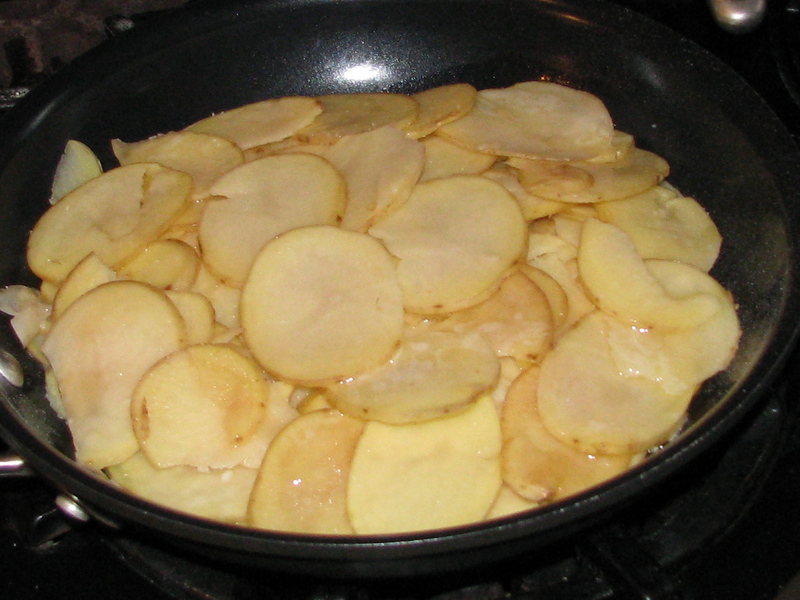 Slice the potatoes very thinly – about 1/8” thick. (Use the thin blade of mandolin) and layer the slices on paper towel, covering the top also. Press down and dry thoroughly. To clarify the butter, melt it in a small saucepan. Using the finest strainer you have, pour the melted butter into a bowl. The solids will remain in the strainer and should be discarded –that is the part of butter that burns and makes things stick. If you don’t have a fine strainer, use a coffee filter. Add enough of the clarified butter to the 10” skillet to completely cover the bottom and turn heat to medium high. Starting in the center, begin arranging the slices of potato in a spiral pattern. When you finish covering the bottom, add salt and pepper and a little more butter. Continue adding layers of potatoes, butter, salt and pepper. Cover and keep cooking for about 10 minutes. Shake the pan frequently to make sure that nothing is sticking. If the potatoes stick, you will have a problem when it is time to serve. Take the pan off the stovetop and put on the counter. Use the serving plate to press the potatoes down into the pan. Put the pan in the oven for 20 minutes, uncovered. After 20 minutes, take the pan out of the oven and press one more time with the serving dish. Return to the oven for another 20 minutes. Check to make sure the potatoes are soft and the top is golden brown. If not, return to the oven for another 10 minutes. When finished cooking, take the pan out, put the serving dish on top and flip over. You should have a beautifully browned potato pie, which will drive the crowd wild. Could you add cheese and it still taste good? The classic recipe does not have cheese. I have never tried adding cheese. Give it a try but I would suggest no more than 1/2 cup of Gruyere.